Voqal was the primary funder of an innovative research project led by Harvard University Professor Gary King and published today in Science magazine that found small media outlets can have a dramatic impact on the national conversation about major public policy issues such as employment, immigration and the environment. 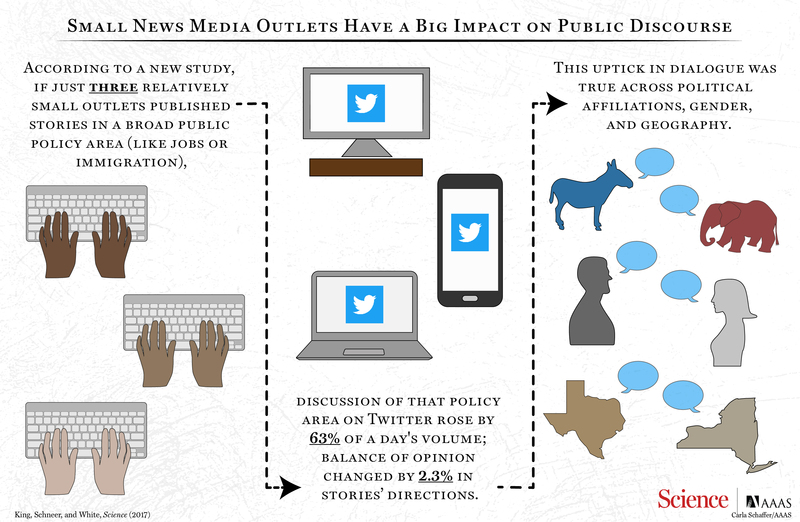 Specifically, the study found that if just three outlets write about a particular topic, it can increase public discussion of that topic across social media, boosting traffic on the subject by 63 percent over the course of a week, relative to a typical day’s traffic. The study, “How the News Media Activate Public Expression and Influence National Agendas,” marked the first time academic researchers have partnered with journalists to conduct a randomized study. For more information on the role independent news outlets played in this important work, read Independent Outlets Have Outsized Impact by Jo Ellen Kaiser of the Media Consortium.